The Kapaa Sands resort is located right on the beach on Kauai's eastern Coconut Coast, centrally located to all of Kauai's great attractions. Watch sea turtles as they drift past, and perhaps even spot a rare Hawaiian monk seal! This unit is right next to the beach, and has both an upper lanai to view the ocean, beaches and sweeping vistas down the coastline, and also a lower lanai where you can have that picturesque dinner before walking down to the beach right in front of you. The inside is clean and comfortable, with two bedrooms upstairs, one with a king bed, the other with 2 twin beds. Come and make Kapaa Sands your Kauai getaway spot! Aloha and Mahalo! We enjoyed our stay at your property ( our first to Hawaii). Great location! ( Breakfast on Lanai with ocean view ...I miss it!!). Comfortable beds and well stocked kitchen. Coconut Marketplace within walking distance (shopping, Farmers Market, Hula show..) Thanks for wonderful stay ! Kauai Pacific Real Estate kept us updated with emails concerning the unit and weather. With rain comes rainbows! Lots of rainbows this year with rains. We love Kapaa Sands. Small enough you get to know your neighbors. I appreciated the new hours on laundromat thank you! Cameras are great idea for safety. Shoreline was so different this year-so many tree trunks to climb around or over. Love watching local fishermen catch fish there. Saw 4 monk seals this year on different beaches. Great memories of get together with neighbors. Thank you! Kapa'a Sands was perfect. The property was clean and well stocked with the things we needed. The view from our lanai was absolutely beautiful. Access to both end of the islands was so easy with Kapa'a Sands central location. The grounds were lovely. We stayed in Unit 2 and it felt like we were in our own little paradise because all of the rush was behind us and the only thing you could hear was the sound of the ocean. Thank you Kauai Pacific Real Estate for such a lovely place to stay on such a beautiful island. We thoroughly enjoyed our seven night stay at Kapa'a Sands 02. Particularly impressive, along with the AWESOME setting, was the quality of the appealing remodel that had been done to the unit. The soft close cupboards/drawers and toilet seats were surely appreciated. And so was that unique dark wood patio table, which featured accompanying chairs that were constructed with fabric that quickly dried following a drenching by the rain. Superb attention to detail for sure! And thanks for providing the numerous photos of the condo on your web site, which helped greatly with our decision to stay there. Also very influential with that decision was your relatively close proximity to the Lava Lava Beach Club, which we wanted to check out after having enjoyed their other location on the Big Island. Thanks so much for contributing to our visit to the beautiful island of Kauai!! We just spent a wonderful week at Kapa'a Sands #2. The unit felt like home from the minute we walked in. Perfect size for two couples and the beds were soooo comfy. Every window had an incredible view and there was always a breeze coming from one direction or another. The lanai and up balcony were wonderful places to sit and sip morning coffee or an afernoon glass of wine. We probably spent more time outside than in. The beach is just steps away with a couple options for swimming. We also enjoyed the pool for an afternoon swim. Not only was there a gas grill poolside for grilling but the kitchen was well appointed for cooking meals at "home". Just a few blocks away is a "you don't want to miss this" bakery (local coffee) and a couple of yummy restaurants. The unit was squeaky clean, very comfortably appointed and the property quiet, peaceful with lush tropical foliage at every turn. I loved the retro island feel of the unit and property. The office staff are ready to help with any issues with the unit and lots of great island info to insure you enjoy your stay. And the price point is right! An easy taxi/uber from the Lihue airport but no airport noise. Don't miss this hidden gem for a quiet, relaxing comfy island home away from home. Mahalo for a making our time on Kauai exceptional! Aloha! We truly enjoyed our time on Kauai. Unit 2 at Kappa Sands was wonderful! The condo exceeded our expectations and what a view! We will definitely be returning and requesting this unit again! I have also already been recommending to friends and coworkers! Mahalo and Aloha! We stayed 5 days at the condo. The location in Kapaa is the best spot. It made it really easy to explore Kauai. The drive was easy going north to Hanalei and Princeville and it was easy to get to Poipu and Waimea. 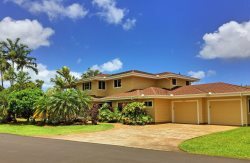 The location makes it easy to avoid a lot of the traffic within Kapaa. Can't beat the spot, with two lanais looking out onto the beach and the ocean. A lot of people mentioned the sound of the ocean in previous reviews, we didn't find it to be a problem." This place was fantastic! Even prettier than the pictures! Spacious and clean. We loved staying here!! The location is perfect to explore the Island. The unit is really nice and has a beautiful view on the beach. It also has all the equipment needed to cook. Overall we had a really good time in Kauai. Four of us stayed in the condo and we loved it. It has great views with a nice swimming beach right out front.